I teach at a private school where the tuition rivals what I paid for my college education. Our campus is tucked neatly into the back corner of a hidden away street outside the city. In the past 20 years it has changed from an old farmhouse into a picture of growing perfection. 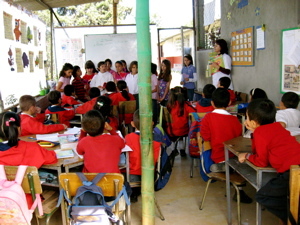 Red trim on white buildings, bright yellow doors, a Colombian flag that whips in the wind, starched uniforms on children that have plenty, imported teachers with native English tongues. And just around the corner, less than a mile from our manicured lawns and gated campus, is our sister school. Her playground is a concrete slab and her classrooms are cramped and tiny and divided by the bamboo poles that hold up their roofs. Her children wear hand me down uniforms and eat the food that our school donates to them- the leftovers, the gifts we put into baskets one week out of every month. 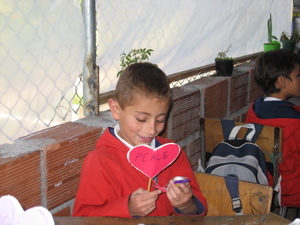 The fifth graders at my school made them gifts for Love and Friendship Day and we delivered them. They were tiny paper hearts with words of affection on them. One side in Spanish the other in English and tied to them with string were small pieces of candy. I’m not sure if my kids got it. If they understood. If it affected them at all. But I understood and I was touched and torn by their smiles, their looks of wonder, their whispered thank yous, their waves goodbye. Precious! I hope you visit them often. It sounds like they could use your sweet smile and love ever once in a while. Bro Tony had us all repeat “I can make a difference!” at the beginning of the worship service Sunday. Your kids might not have gotten it right at that moment, but you did and that will make a difference. It will make a difference later in not only the “sister school” kids, but in your kids. Tonight at church, my friend Chris talked about the connection between “The Lord is my shepherd, I shall not want” and the verse in Proverbs that says, “Delight yourself in the Lord and He will give you the desires of your heart.” A lot of times we take those to mean that He’ll never refuse us anything as long as we love Him. And that’s just a bunch of honky. It really means He’ll always give us what we need, and if our desires are being conformed to His, we’ll be getting the desires of our heart. All the stuff we think we need just clouds out the important stuff. We’re all just a bunch of spoiled rich kids, I guess.